The family will receive friends from 5:00 p.m. – 7:00 p.m. on Thursday, September 20, 2018 at Hohner Funeral Home with Rosary Service beginning at 7:00 p.m.Mass of Christian Burial will be held at 11:00 a.m. on Friday, September 21, 2018 at Immaculate Conception Catholic Church of Three Rivers with Fr. Antony Rajesh as celebrant. Interment will be held at Riverside Cemetery, Three Rivers. Norman Harold Brunner, age 83, of Three Rivers passed away at home surrounded by his family on Sunday, September 16, 2018. He was born on October 25, 1934 the son of Sherman and Thelma (Gillett) Brunner in Newberg Twp, MI. Norm attended schools in Three Rivers graduating from Three Rivers High School in 1952. He went onto to attend Western Michigan University where he was a member of Sigma Phi Epsilon. He spent his working years in sales most recently at Curtis Trailer in Schoolcraft, MI. Norm was in the 172nd airborne fighter bomber squadron in Battle Creek, MI. On August 2, 1958 Norm was united in marriage to Carlene Marietti at Immaculate Conception Catholic Church of Three Rivers with Fr. John Fackler officiating. Norm was a founding member of Three Rivers Community Players where he was a board member for many years and will be remembered for the many plays he acted in. He was also a member of the Kiwannis Club and Past Exalted Ruler of B.P.O.E. #1248 where he was a lifetime member. He had a love for antique cars, especially his 1961 Chevy Impala Convertible. He had an extraordinary memory and was well known for his joke-telling. Norm was preceded in passing by his parents; brother, Don; sister-in-law, Mary Marietti and nephew, Tony Marietti. He is survived by his wife of sixty years, Carlene; children, Michele (Michael) Brewer; John Brunner, and Allison (Joseph) Giles; seven wonderful grandchildren as well as many nieces and nephews. Memorials in Norm’s name may be directed to West Michigan Cancer Center where he received kind and compassionate care for the past two and a half years. Envelopes available at the funeral home. When your condolences are submitted they will not display until approved by the Hohner staff for appropriateness out of respect for their memory. They should appear within 24 hours or less. Thank you for your understanding. 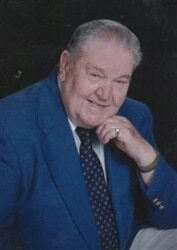 Mr .Brunner was a humorous man who always made you feel welcome in his home. His kind and loving spirit was evident in every chance meeting on the street in the post office or at the gas station!! He will be missed. Carlene and kids, sorry to hear of Norm’s passing. The Brunners were neighbors on East Street my entire childhood. I remember fondly growing up on that block and Norm’s presence. He always seemed larger than life and when he had something to say, as a child you listened. I know you will miss him. Take care.